This month marks the third anniversary since we started investing for clients. We’re humbled to have the opportunity to help thousands of Australians grow their savings every day. Today our clients range from 18 to 80. They come from Alice Springs in the centre to Kalgoorlie in the west, Swansea down south in Tasmania and Townsville in North Queensland. As we promised on day one, our investment philosophy and strategy haven’t strayed. Rather than trying to time the market or pick stocks (an expensive and dangerous endeavour), we’ve generated our consistent returns with a strategy based on decades of evidence and by not changing course. We strongly believe that the most sensible investment advice for most people is to avoid trying pick winners, invest in a broad mix of assets, keep your costs low, rebalance occasionally to reduce risk and don’t worry about what happens in the short term because it’s meaningless noise. Over the last year there has been plenty of market noise to distract investors and tempt them to change course – particularly around Brexit and the US election. It was easy to be swept up in the hype of either event and change strategy. Even smart and very well regarded fund managers fell into this trap and it cost them and their investors dearly. 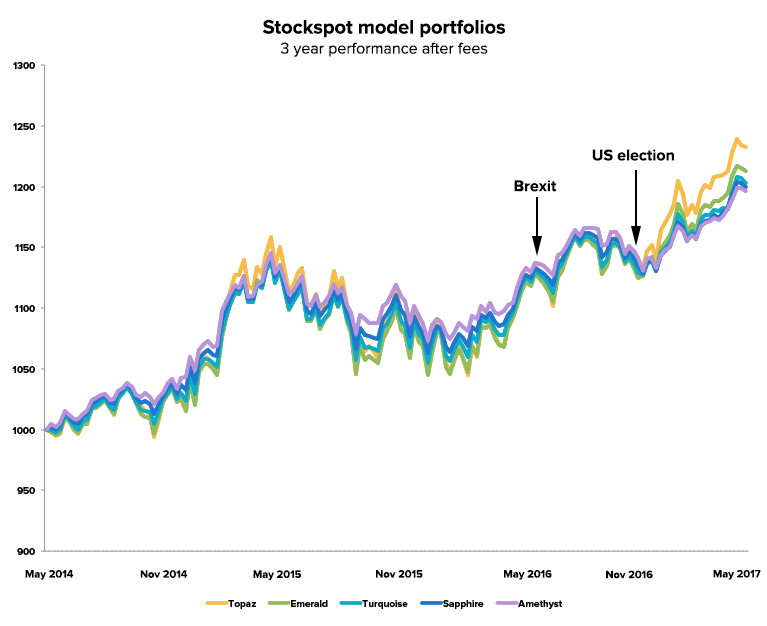 Despite the turmoil from Brexit and surprise of Trump election victory in the US, the Stockspot model portfolios earned 8.8% to 14.2% in total returns after fees over the 12 months to 30th April 2017. Even with the peaks and troughs of the last few years, our model portfolios have climbed higher. Global markets are now as high as they’ve ever been and our clients have benefited. We sometimes get asked by clients how to know whether markets are ‘cheap’ or ‘expensive’. The truth is we don’t know – nobody does. The good news is that if you are investing with a diversified strategy like ours over a reasonable timeframe, it doesn’t matter. Stock picking fund managers sell the story that they possess a special ability to calculate the fundamental ‘fair value’ of a company or know when markets are cheap or expensive. The reality is that fair value is an abstract concept that markets and stocks pass through occasionally. History shows that stocks and markets can be expensive or cheap for decades so it’s unwise to try and time entry and exit points based on a perception of ‘fair value’. Expensive can always get more expensive and cheap can always get more cheap. This is the reason why so many active fund managers continue to underperform the market. When it comes to investing, being right with your ‘fair value’ but wrong with your timing is the same as being plain wrong. Add to that the costs of actively buying and selling and it’s even more difficult for stock pickers to get back to square one. If that wasn’t hard enough, consider that ⅔ of stocks underperform the index so if you pick one at random it will probably be a dud. No wonder there are very few experts who succeed in consistently beating the market. The finance industry is desperate for you to believe you need to pay high fees to pick stocks and time the market but the truth is you don’t need to. It generates commissions, brokerage, fund and advice fees for them but that comes directly out of our pocket. As our Fat Cat Funds Report shows, that can cost you hundreds of thousands of dollars over your lifetime. Investing in index funds, like we do for our clients, lets you piggyback off the hard work of active fund managers without paying them a cent. Let the millions of finance experts do what’s called ‘price discovery’ and then you get access to it for next to nothing. Index investing is the ultimate showcase of the power of the crowd. Everything we do at Stockspot is focused on helping our clients reach their financial goals without high cost and high risk that come with trying to outsmart the market. The one certainty about markets is that they will continue to be unpredictable. The one certainty about human nature is that people will keep trying to predict them. Our clients who have done best over the last 3 years are those who have ignored the market ‘noise’ and also understood that owning a broad mix of investments, over the long run, is a much smarter strategy than just holding cash. These days more of our clients are also using dollar cost averaging for an even smoother investment path. This week I met a client who knew nothing about investing 2 years ago but now feels confident using Stockspot to grow the family finances for their long term goals. That makes me so excited and shows the huge potential for technology to empower people to make better decisions. Digital financial advice is still in its infancy and the future is bright! 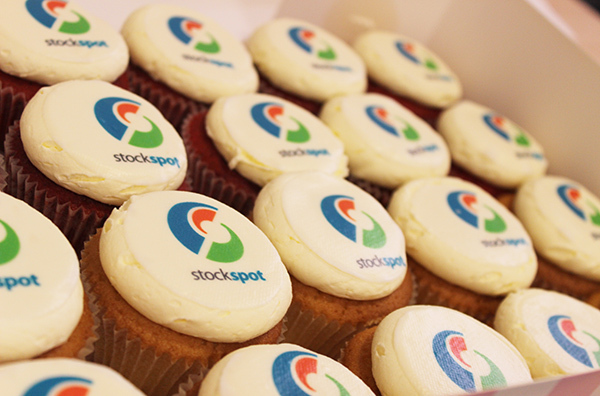 It’s been an honour and pleasure to steer Stockspot to where it is today and I can’t wait to keep helping more Australians to become smarter investors over the years to come. Investment in financial products involves risk. Past performance of financial products is no assurance of future performance. Please read our Advice Disclaimer. What are the best dividend ETFs?